Vice President Al Gore address to the graduating class at MIT's 130th Commencement covered the changing relationship between the two different cultures of technology and society. Gore was chosen as a speaker in part because "he has been a leader as congressman, senator, and vice president in the areas of science, space, and technology policy," said President Charles M. Vest in March. In the months before Commencement, Gore had solicited input from graduating students in an online dialogue. Students sent anonymous electronic mails to Gore's staff about topics related to technology and society. Several of these messages were incorporated into Gore's address. Gore's speech was not without some humorous moments. Noting that MIT's first president, William Barton Rogers, died in the middle of his Commencement speech in 1882, Gore said he was comforted that he would not be remembered as the stiffest speaker in MIThistory. The graduates themselves added a bit of comedy to Gore's speech. While a strong Secret Service presence prevented anything dramatic, an anonymous party managed a hack of sorts by distributing "buzzword bingo" sheets. Students were given bingo cards with technological buzzwords, which they would cross out as Gore went through his speech. When someone got five crossed-out words in a row, the winner was supposed to hold up the card. Gore was able to escape without anyone declaring bingo. Gore himself was aware of the hack. 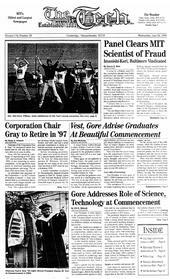 After a group of Sloan School of Management graduates cheered, Gore asked, "did I say a buzzword?" Gore began by questioning why a "schism between science and the rest of society," exists, tracing its origin back to the trial of Galileo by the Catholic Church in 1633. Winston Churchill, in speaking at MIT's 1949 Commencement, also referred to the existence of this schism, Gore said. While people in England and America spoke the same cultural language, Churchill said that both "had about as much communication with MIT as though the scientists spoke nothing but Tibetan." Gore continued by citing evidence that this divide persists today. One sign that society and science do not share open communication is that popular metaphors very rarely have a scientific basis, he said. In order for scientific metaphors to be used to describe other systems -- such as how Darwinian theory of natural selection has been applied to economic and political systems -- popular society must already have a grasp of these scientific concepts. "I believe it is time for a new effort to build bridges between these two cultures," Gore said. This can be accomplished by encouraging more dialogue between science and society. And it is the role of MIT, as leaders in the technological community, to push force with this effort, Gore said. It is our responsibility "to understand what our learning and discoveries may do to man and society, and to transmit that knowledge to new generations," Gore said, quoting from former MIT President Jerome B. Weisner's inaugural address. Gore continued by providing specific examples of what the benefits of a closer connection between science and society can provide. The political system, for example, can be better understood by applying the logic of science to current events. Gore then shifted topic to address the possibly dangerous affects growing technology can have on society. He mentioned the power of genetic engineering, the proliferation of nuclear weapons, and the destruction of the ozone layer. What the scientific community needs to do in all these situations is to find a way to balance the potential for good and for harm that new technologies provide, Gore said. Gore warned against letting fear of the possible unexpected uses of new technology dissuade progress. The challenge we face today is to figure how to use the knowledge coming out of new technologies, "as a source of energy for adaptive change that benefits society as a whole," Gore said.